Mix eggs, heavy cream, salt, and pepper in a blender. Thaw the spinach, place it in a kitchen towel, and squeeze to remove any excess water. Pull it apart with your fingers to separate it. Place it in a big bowl along with the cheese and the chopped bacon. Place the spinach mixture on the bottom of the pie crust, then pour the egg mixture on top. Bake for 35-45 minutes or until the egg mixture is set. You can test to see if it's done with a thin knife. Let tart cool for 10 minutes before serving. You can substitute spinach with broccoli, Swiss chard or kale. You can also substitute the bacon with ham. 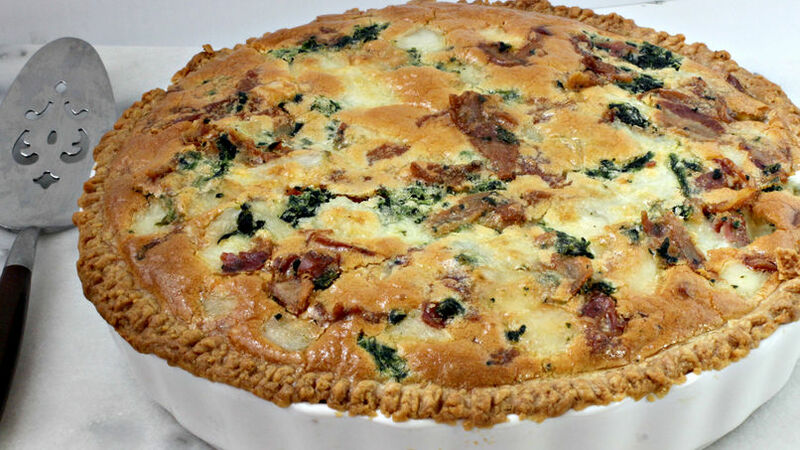 Whether for a special occasion or a weekend brunch, this delicious broccoli and bacon tart or quiche is always a hit. It even makes for a great light lunch. The best part is that you can make it in advance and just heat it up when you're ready to eat it.